Falcon was expected to fly in 2008; instead, it made a shock exit after Stage Two. From its smooth and powerful six-cylinder engines, to its sophisticated five- and six-speed automatics, to its spacious and comfortable interiors, the FG Falcon is a thoroughly contemporary and mostly impressive expression of the 'big car for a big country' ideology. But unlike the 2002 BA Falcon, a car that showed what a backs-to-the-wall Ford Australia was capable of, the FG does not significantly raise the bar for large cars. As a result, it also doesn't carry home to Broadmeadows our distinctive red COTY trophy. FG cleared the initial cull at You Yangs - and deserved to - but by the time the two-up Woodend loops were completed on day five it was clear that the Ford had issues that would ultimately derail its COTY campaign. A lack of consistency across the range best sums up the Falcon's problems. While some models, such as the stunning G6E Turbo, stand out like a beacon, others, such as the nose-heavy XR8, make us wonder how it came to be signed off. Crucially, the big-selling base-model XT felt tired, despite its low kays, with steering rack rattle under heavy cornering loads worse than any of the front-wheel drive cars. The rear end was skittish, the ESP tune not up to Ford Australia's usual standards, and the amount of suspension and tyre noise transmitted into the cabin did it no favours. Things improved farther up the range, but where you delighted in an obvious strength, such as the staggering performance of the XR6 Turbo, it was frequently negated, in that car's case by a slow and heavy clutch and gearbox. The driving position across all models was the subject of much debate, with taller testers such as Carey and Robinson lambasting the limited range of steering height adjustment. As Carey stated, pointedly: "It's an all-new car, so why isn't that fixed? They had the opportunity to do it." There was other evidence of cost-cutting: no rear door pockets or door grabhandles on any model, no adjustable rear headrests for the outboard passengers, and none whatsoever for the centre-rear passenger. While these may seem relatively trivial matters to some, the omission of standard curtain airbags on all but the G6E and G6E Turbo is a disappointing safety blemish, albeit one ameliorated by the option's reasonable cost. That aside, the FG regains valuable ground against the safety criteria by being the first Australian five-star ANCAP performer, and there's little doubt that significant effort has gone into engineering a much safer structure. There's equally little doubt that the FG remains good - and sometimes great - value. This comes together most obviously in the G6E Turbo. At $54,990, this is a car that embodies the European sports sedan ethos at a fraction of the cost. Its engine is capable of landscape-crushing performance and its chassis of handling all that power and torque, all the while communicating fluently with the driver while keeping passengers relaxed and comfortable. The G6E Turbo was a cut above all other FGs, including the XR6 Turbo, appreciation of which was tarnished by the unrefined thumps emanating from the diff under full throttle upshifts in the manual version. 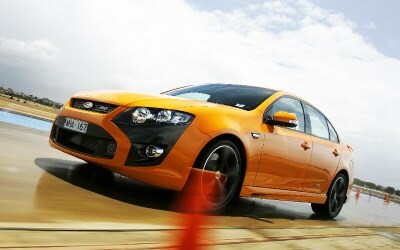 That said, the XR6 in either turbo or atmo form is a far superior dynamic offering to the disappointing XR8. "Extra weight of the V8 blunts turn-in and pushes the nose wide in hard cornering," noted Sean Poppitt. The superiority of the XR6 Turbo in particular over the XR8 caused more than one judge to ponder the future of V8-powered Falcons: "The turbo is faster, better balanced and more frugal - is the V8 dead?" asked Poppitt. It was a question that remained hanging even after the high-performance FPV GT and F6 were put through their paces, with results that basically mirrored the XRs. Some judges also felt the FPV's lacked differentiation from their more mainstream siblings, considering the price premium. The Woodend road loops confirmed that a decade of development has dramatically transformed Ford's 4.0-litre in-line six. Powerful, refined and responsive, more than one judge declared it 'world-class'. Add in a choice of five- and six-speed automatic transmissions and this was a drivetrain as good as any on test. The real world also gave the chance for the XT to regain credibility thanks to its outstanding ride quality. This was allied with masses of space and a rear seat Robbo rated more comfortable than the new BMW 7 Series. Unfortunately, the bangs and thunks remained. Moving up through the G6E and XR6 Turbo, the ride became a touch more terse but, at the same time, the interior presentation lifted noticeably. No doubt, the FG has the VE Commodore beaten when it comes to modern, clean and attractive cockpit presentation. But overall, FG didn't blow our 2006 COTY winner away. Indeed, in the final analysis it was FG being banished by an impressive, imported 2008 crop.